Of the 13 epistles traditionally attributed to Paul, only 7 are now believed to have been actually written by Paul: Romans, 1 & 2 Corinthians, Galatians, Philippians, 1 Thessalonians, and Philemon. Four more (Ephesians, 1 & 2 Timothy, and Titus) are viewed by most scholars as pseudepigraphical (falsely attributed works, texts whose claimed author is represented by a separate author, or a work whose real author attributed it to a figure of the past). In other words, various types of forgeries. Authorship of the remaining two Pauline letters (2 Thessalonians and Colossians) is disputed, with no agreement among scholars. We start with Galatians, written around 55 CE and mainly concerned with the application of Mosaic Law to Gentile Christians. Next is Ephesians, written in Paul’s name by a later author. It deals with maintaining unity and keeping the church pure and holy. Then Philippians, written sometime between 52 and 62. (Estimates of the dates of most of these epistles vary widely.) Colossians was supposedly written in the mid 50’s while Paul was in prison, but could have been written as late as 80 by another author. 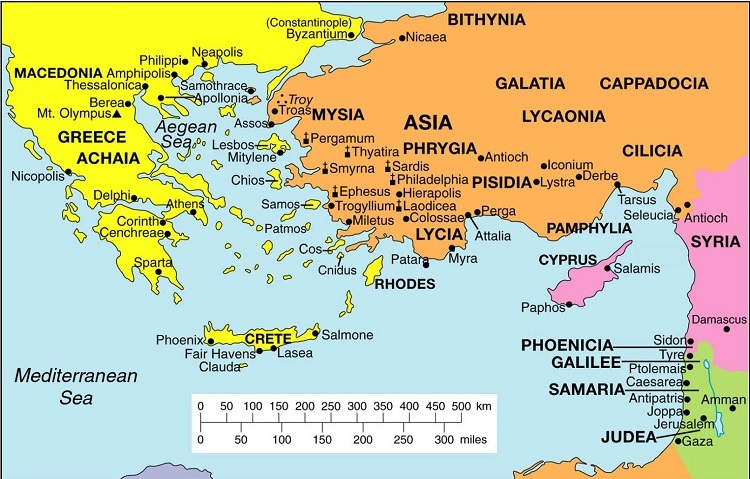 1 Thessalonians, around 51 CE, was probably the first book of NT. Its content is mostly personal except for the last 2 chapters. 2 Thessalonians cannot be dated because of disputed authorship. 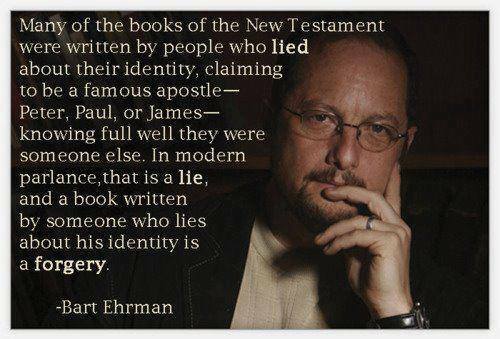 If Paul wrote it, then it belongs in the early 50’s; otherwise, it’s the work of someone else much later. Here is another map to help navigate these letters. 1 and 2 Timothy, Titus, and sometimes Philemon, are referred to as the Pastoral Epistles, because they are addressed to pastors of churches and discuss issues of Christian living, doctrine, and leadership. The letters to Timothy cannot be dated; either Paul wrote them between 62-67 CE, or (more likely) another author wrote them in the late first to mid-2nd century. They were not necessarily even written by the same author. Titus, likely written in the late first or early second century, is similar in style to 1 Timothy. Philemon, supposedly written around 52-54 CE, concerns forgiveness and reconciliation. The last 8 books are referred to as ‘General Epistles’, because they were written for general audiences rather than specific churches or congregations. Hebrews (originally attributed to Paul but long known to have been written by an unknown author) encouraged Christians, in polished and eloquent Greek, to persevere in the face of persecution. No one knows when James was written or who by whom; it may not even actually be a letter, but an example of Wisdom Literature. The author of the two letters of Peter claimed to be Peter the apostle (Saint Peter), but this has long been debunked. The 3 letters of John are traditionally attributed to John the Evangelist (the apostle), who also supposedly wrote the Gospel of John, and Revelation (but of course everything is disputed). And finally, Jude; not much is known about exactly who he was.